LVR are able to help employers fulfil their legal duties to protect workers from harmful optical radiation, by considering how workers may be exposed, and undertaking an assessment of the exposure conditions, taking on-site measurements where necessary. We provide a full report of the assessment, detailing where exposure limits could be exceeded, showing maximum allowable exposure times, and how this changes with viewing distance. If there are any instances where the risk needs to be better managed, we work with employers to help find sensible practical solutions. We take care of the complexity in measuring and assessing optical radiation, providing you with a report, written in plain English, allowing you to assess the risk and decide if changes are necessary. This helps employers insure they are meeting legal obligations and protecting their workers, in a way that practical and cost effective. Directive 2006/25/EC requires that all employers must ensure that workers are not exposed to artificial optical radiation in excess of mandatory exposure limit values (ELVs). In the UK, implementation of the Directive is through specific occupational health and safety legislation known as the Control of Artificial Optical Radiation at Work Regulations 2010. The regulations reference 15 different types of exposure limit that must be considered, spanning from the ultraviolet regions, through visible light, and into the infrared ranges. 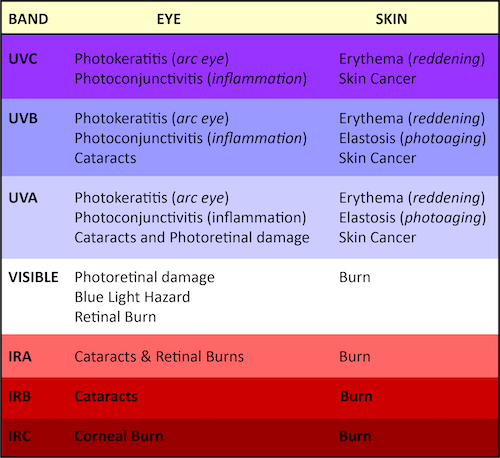 Exposure to optical radiation in excess of the limits can cause harmful effects to health of both the eyes and skin. Manufacturers and suppliers of equipment emitting potentially harmful levels of optical radiation should inform users of the risk, and have a specific legal obligation to do so through section 6 of the Health and Safety at Work Act 1974, and the Provision and Use of Workplace Equipment Regulations 1998. Any concerns about optical radiation exposure and the precautions necessary for safe use should, in the first instance, are taken up with the supplier of the equipment. From our experience, it is often the case that manufacturers and suppliers are still playing catch up in meeting their regulatory obligations. In which case the end user is left with having to determine themselves if limits are likely to be exceeded, and then decide what control measures to limit exposure are necessary. In such instances, or cases where it would not be possible for a manufacturer to supply hazard data, LVR are able to help employers in considering the workplace activity, and where necessary, undertake the required measurements using calibrated instruments to determine exposure. We are able to provide a full assessment of occupational optical radiation exposure, working closely with you to undertake task analysis, and determine exposure. In completing the work we are able to provide you with a full written report of findings along with sensible suggestions as to how improvements can be made to ensure the good health of your workers and that you are meeting regulatory requirements. Work is undertaken using a range of measuring instruments capable of determining exposure levels and full spectral analysis over the necessary hazard regions, following the guidance of British Standards BS EN 14255 parts 1 and 2, Measurement and Assessment of Personal Exposures to Incoherent Optical Radiation, which covers UV, visible and IR assessment. Contact LVR to more about our cost effective service for workplace exposure assessment.